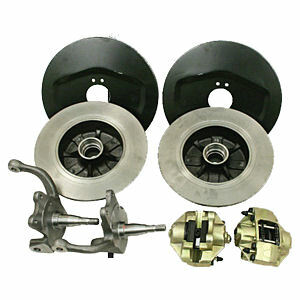 Ball Joint Front Disc Brake Kits have great stopping power. This bolt on kit comes with Calipers, Rotors, Backing Plates and Spindles. (Requires Bearing and Seal kit for 66-68 bugs) Brakes come 4/130 Bolt Pattern, 5/130 Bolt Pattern, Chevy 5 on 4 3/4 pattern and Blank Rotor kit. Does not work with 14" wheels. Click more options to choose your kit.